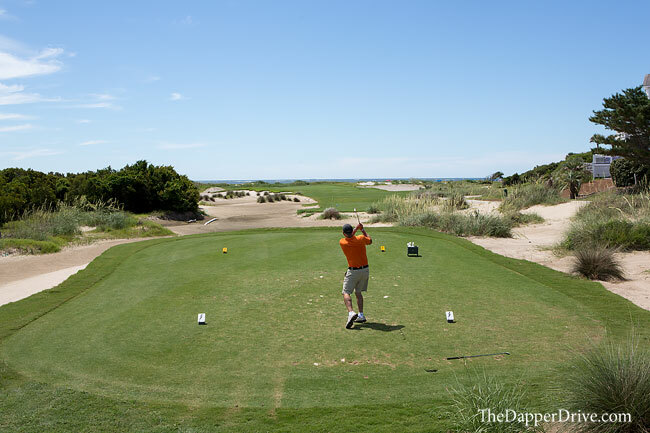 “What’s the yardage?” My Dad asked, standing on the windswept 18th tee of Wild Dunes Resort, waves crashing in the nearby distance. “125, playing 135-ish,” I reply, tossing a few grass clippings in the air. Pulling his 7-iron, he takes his patented two practice swings, addresses the ball, and gives it a might smack. The clanging sound of his two-decade old iron — along with the ultra-flat ball flight — indicate, to me, less than perfect contact. And in the end, yield a less than ideal result, with his ball falling short of the green. “How’d you hit it Pops?” I ask. “Not too bad actually,” he replies. His answer told it all. 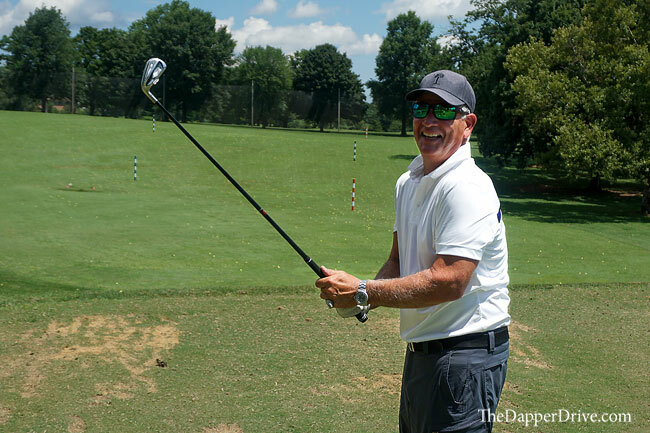 Though his set of 1998 Pal Joey’s — which he’d purchased when I first took an interest in the game — had served him fine over the years, he was more than overdue for new golf clubs. Not surprisingly, he agreed it was time for an upgrade. Until now, he never felt it was necessary. He only played a handful or so times a year, largely to spend time with me or join some buddies in a company scramble. He didn’t practice, and rarely was concerned with score. 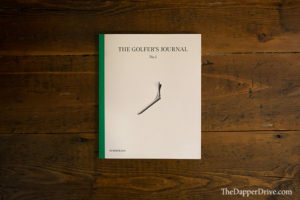 For him, golf was more about the exercise, being outdoors, connecting with friends and enjoying the camaraderie of a post-round beverage. However, his recent retirement sparked a newfound interest in getting more serious about the game. 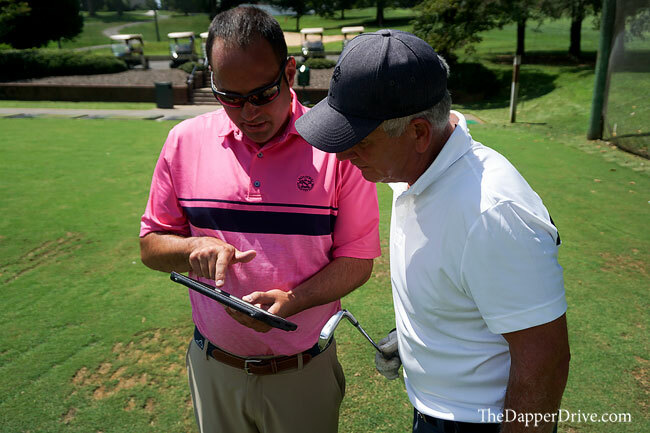 No, he won’t be grinding for hours on the range, but a desire to improve his skills and (legitimately) get his scores into the 90’s meant new technology was a must. As agreeable as he was on picking-up new clubs, he was equally as hesitant about getting fit for a set. His logic? “I’m not good enough for a fitting to matter.” Instead, he proposed simply buying off the rack with the “standard” specs. And there it was. 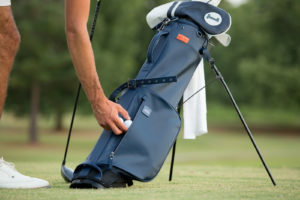 The biggest mistake I believe golfers, especially high handicappers, make: thinking because they aren’t going low, custom fit equipment isn’t necessary. 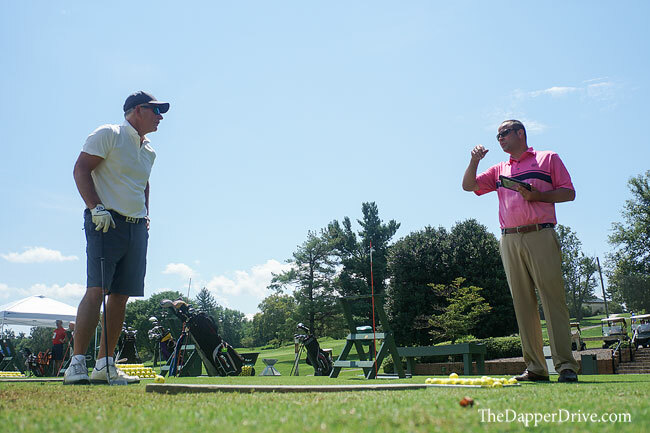 To the contrary, the high handicap player benefits equally — if not more than — a low handicap player. After all, the guy hitting it inconsistently needs all the advantage he can get! After some persuasion, my Dad agreed — it was time for a fitting. 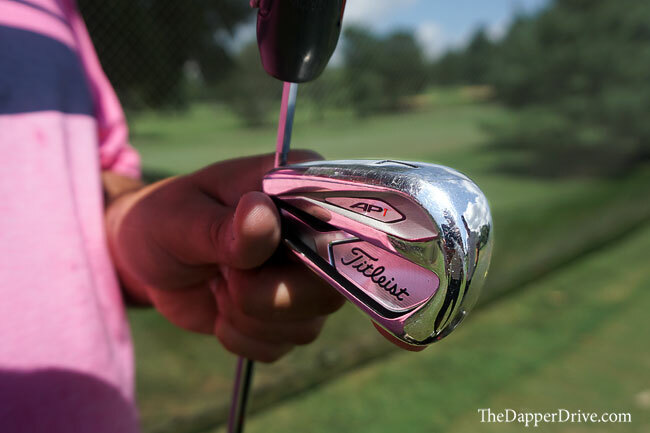 When it came time to schedule a fitting, I knew exactly the company to turn to: Titleist. Over the years, my personal game has grown from beginner to a plus handicap. Early in my golfing days, I initially chose Titleist for the same reason many kids my age did — Tiger was playing them! I played Titleist when I was struggling to keep it below 100, and also when I was gunning to crack 70. My highest tournament round (103) came with a set of DCI 981’s, while my lowest (63) were courtesy of a set of CBs. I’ve switched up equipment brands a few times along the way, but always seem to find myself coming back to Titleist. They are best in class, and I knew my Dad would benefit from their expert club fitters. Search for a Titleist Fitting Location: Enter your zip code to find a club certified in Titleist fittings. When you set up an appointment, you’ll have the full attention of a certified fitter. We chose to do this, and settled on Roanoke Country Club for my Dad’s fitting. Find an upcoming Fitting Event: Search by location to register for an upcoming Titleist fitting event. No more than 15-minutes after he started smacking balls, my Dad quickly understood why a fitting was so important. 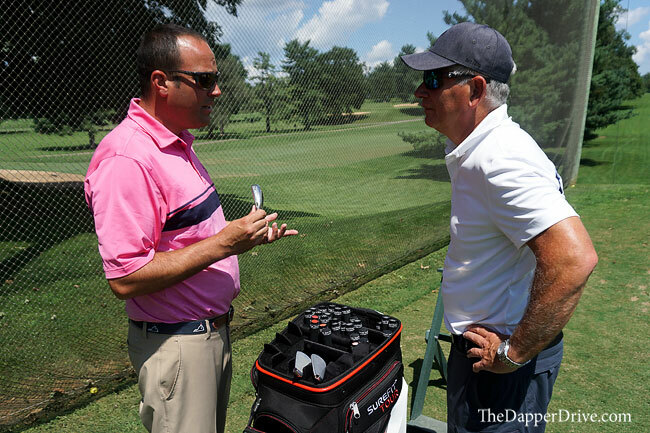 Already, Tim (our expert Titleist club fitter) had shared a plethora of helpful information with my Dad including his swing speed, club path, and his angle of attack to name a few. This was all during his warmup, and armed with this info he actually made a few little tweaks which helped his ball striking. I won’t lie, there were plenty of chunked, hosel, toed and other mishit shots throughout the day. Such is the life of a 30-handicap, right? However, my biggest takeaway was that every shot need not be perfect. In fact, those mishits are just as important in the fitting process as the few flushed ones a high-handicap player might hit. 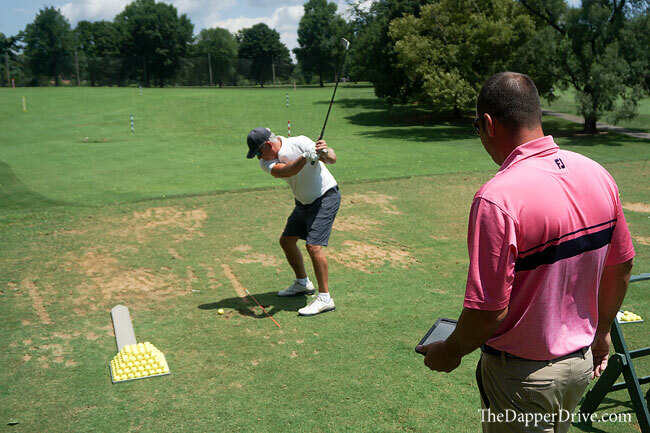 Understanding the bad shots helps the club fitter arm a golfer with the best equipment to maximize the mishits, too. After all, golf is largely a game of misses, isn’t it? 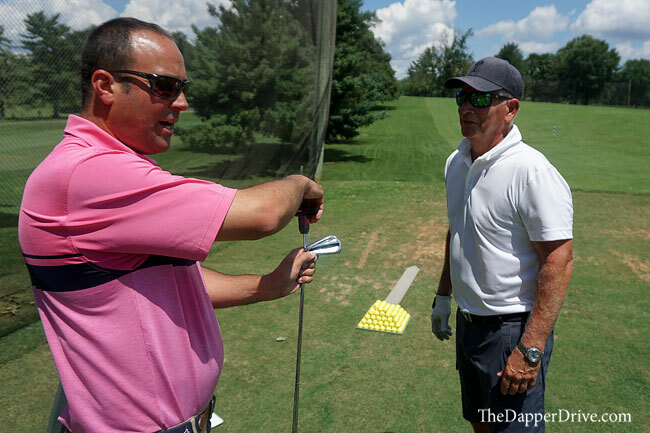 1) Warmup / Launch Monitor: As my Dad loosed up, Tim analyzed his metrics on the Flightscope launch monitor and assembled a “base” club head and shaft combo. 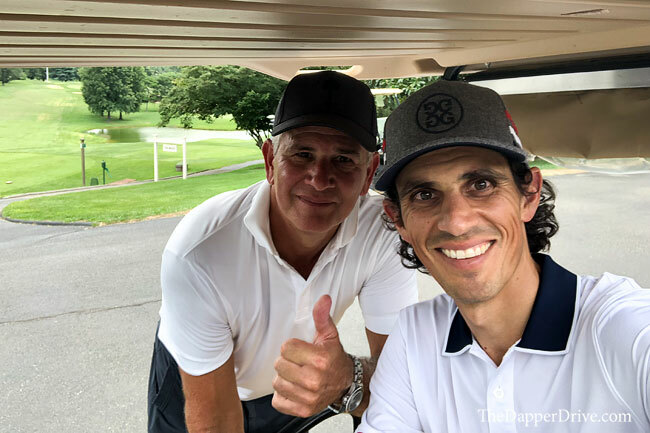 2) Choose a club head: Tim began by walking though the various options and chose to start with the Titleist 718 AP1, which ultimately was the best club head for my Dad (read: lots of forgiveness). Usually, a player will test a few different heads to see which is best. We briefly switched in another, but quickly realized the AP1 was the right one. My Dad particularly liked the fact that these game improvement irons still maintained a slim profile (vs. a bulky looking iron). 3) Switch-up the shafts: We began with a standard length, regular flex steel shaft. With a 7-iron club head speed around 70, Tim put a graphite shaft in the mix, and toyed around with a few different lengths (my Dad is ~6’2” tall). 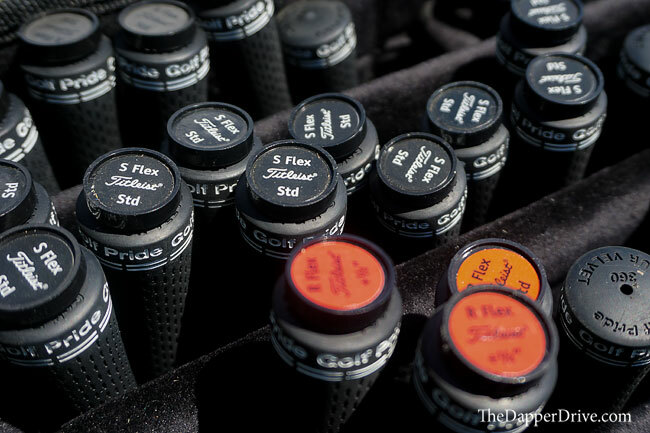 Ultimately, it was the +1/2 inch graphite shafts that yielded the best performance. His launch angle (and in turn carry yardage) improved significantly with the graphite shafts. His posture immediately improved, too, and the crisper sounding contact alone validated this was the shaft for him. Graphite shafts in his irons! Had we bypassed a fitting, I can assure you we wouldn’t have considered graphite shafts and may not have gone with the longer shafts, either. 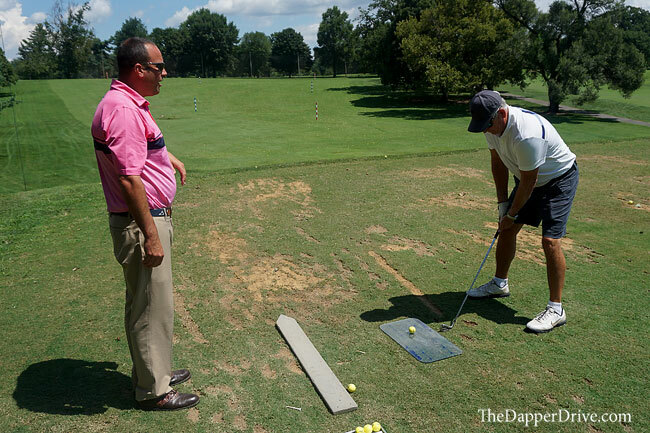 4) Lie Angle: Tim also brought out a fitting board, to ensure the best lie angle. We toyed around with a few upright shaft angles, but ultimately a neutral lie angle proved to be ideal. 5) Grips: Often overlooked, grips are as important part of the club as any. After all, it’s our only connection with the club. 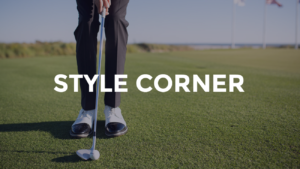 Not only does the style of the grip matter (cord, composite, etc. ), but the size is important as well. My Dad opted for a mid-sized grip over the standard size. The launch monitor was utilized throughout the entire fitting process, but I was most impressed with Tim’s interaction with my Dad. He continually asked for feedback the entire step of the way, while also making decisions through observation. 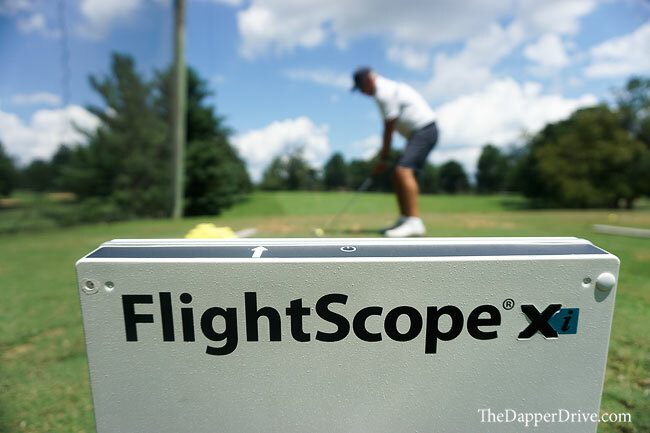 Yes, analyzing the launch monitor numbers are important, but a skilled club fitter who can tap into his knowledge and experience in the craft is absolutely imperative. We also spent some time with woods, as my Dad is completely revamping his bag — Driver to wedges. 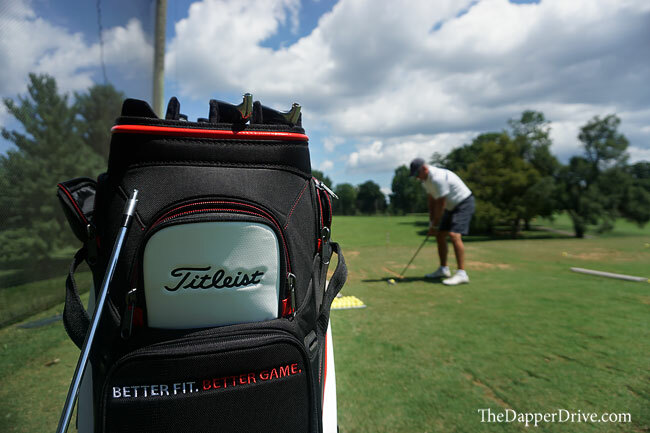 I’m beyond excited to see how the new, properly fitted Titleist equipment helps my Dad improve his game. I expect the equipment alone will yield a higher trajectory, increased distance, better misses, and in the end, more fun on the golf course. And that’s all before he puts in a bit of practice time! As you can see, he’s stoked for his new set of Titleist clubs too. Stay tuned for a follow-up post where I’ll showcase his full-set of Titleist clubs, and report back on how the custom fit equipment has impacted his game. We’re expecting big things!